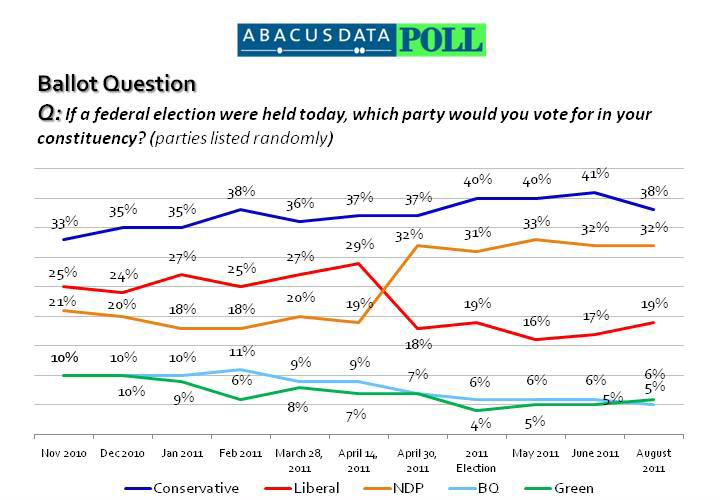 According to a new national survey from Ottawa-based Abacus Data, the Conservative Party has a six percentage point lead over the NDP in national vote intentions. Nationally, the Conservative Party has the support of 38% of decided voters, followed by the NDP at 32%, and the Liberal Party at 19%. The Green Party and Bloc Quebecois are well back at six percent and five percent respectively. Demographically and regionally, the Conservative Party continues to do well among men, among older Canadians, and in English Canada while sitting well back of the NDP in Quebec. The NDP has built a strong base of support among women, in Quebec, and is now statistically tied with the Conservatives in British Columbia. The Liberal Party continues to hold onto about one in four Ontario and Atlantic Canadian decided voters but trails the other two parties in other regions of the country. Respondents were asked also to rate their impressions of the major party leaders. Stephen Harper remains a polarizing figure with 42% of respondents saying they had a favourable impression while 43% indicated they had an unfavourable impression. In contrast, and not surprisingly, Jack Layton’s numbers were very positive. Fifty-seven percent of Canadians surveyed said they had a favourable impression of the NDP Leader with only 18% saying they had an unfavourable impression. His numbers were particularly strong in Quebec with a favourable rating of 73%. The other party leaders fair less well in part because many Canadians do not know enough about them to form a clear opinion. Interim Liberal Leader Bob Rae’s numbers tilt negative with 20% saying they have a favourable impression and 33% saying they have an unfavourable impression. However, 39% said they have a neutral impression of the interim Liberal leader indicating an opportunity to move the dial. Similarly, Nycole Turmel’s numbers lean negative with a large percentage of the population neutral or unsure about her. Thirteen percent said they have a favourable impression while 28% said they have an unfavourable impression with 17% unsure and 42% neutral towards her. Between August 12 and 15, 2011 Abacus Data Inc. conducted an online survey among 1,003 randomly selected Canadian adults from an online panel of over 150,000 Canadians. The margin of error—which measures sampling variability—is comparable to +/- 2.5%, 19 times out of 20.